Enjoy your meal while surrounded by Mary Tellez’s Custom Mosiacs. 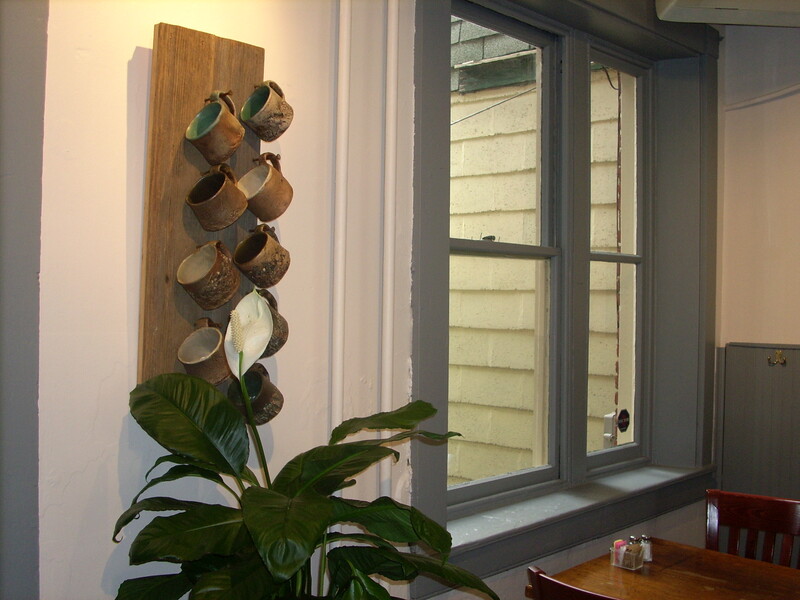 Mary’s work is created primarily from china, crockery and tile found in thrift shops, salvage yards and dumpsters…. not surprising once you know Mary’s penchant for a great bargain and for repurposing items that might otherwise end up in a landfill. The colors, patterns, textures, curves and ridges inspire and direct Mary’s designs. Over time she has found a sense of spirituality in the mosaic process. When considering each piece and it’s contribution to the whole, thoughts come to mind about how the item has been discarded– perhaps because it was viewed as unfashionable or imperfect. The potential for what at first appeared useless is found, the multiple fracture lines of the mosaic add dimension and interest, and ultimately a new vision emerges from broken elements. Enjoy your cup of coffee in “CrackedClay” mugs by Tom Abel. My wife and I love coming into Lancaster City on a Saturday morning. We usually will stop at “On Orange” prior to our Central Market shopping. The breakfast is one of the greatest all around. We enjoy it very much. And..